The Tefal RK302E15 8-in-1 Multi-Cooker is perfect for cooking a variety of foods to perfection using minimal effort. Using the machine could not be simpler thanks to the easy-to-use electronic control panel, this machine boasts a ten cup capacity, allowing you to cook for the whole family with ease. And thanks to delayed start and keep warm functions, your dinner is always ready when you are! The 8 in 1 cooker is stylish with its black and stainless steel finish and also includes a non-stick removable bowl for easy cleaning. This ingenious cooker also has a large 2.2L (10 cups) capacity and comes with a free recipe book. Delicious food need not be time-consuming with this handy Multi-Cooker. And it even has a setting for desserts! The Tefal RK701115 Slow Cooker has 4 exclusive cooking settings that allow you to cook rice, steam vegetables, slow cook and rice pudding or porridge. Tefal RK701115 Multi Functional Slow Cooker comes with the combination of black and stainless steel casing. The lid comes in black without a viewing window and locks with the hinges on both sides. The cooker does not compromise on style with blue LED control panel and brushed stainless steel housing, this cooker will fit into any kitchen. You will find yourself using this constantly. It is ideal for cooking stews because the meat ends up being so tender which means you can use the cheaper cuts of meat with great success. This item is also perfect cooking rice. We have all had disasters cooking rice but you might well find that to be a thing of the past. The automatic keep warm function switches on at the end of cooking so the food is ready to eat when you are. 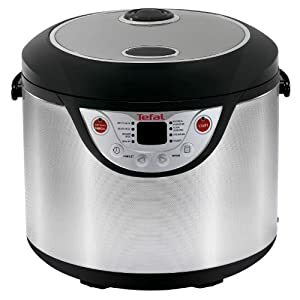 All in all the Tefal RK701115 Slow Cooker is a great addition to any kitchen and one of the most practical things I have in my kitchen so why not get one for yours today!